Each coloring page includes a poem along with it corresponding to a letter in the alphabet. This is a great way for kids to have fun coloring while having the biblical message of creation reinforced, along with practicing the alphabet. Great for kids of all ages (and adults too!). 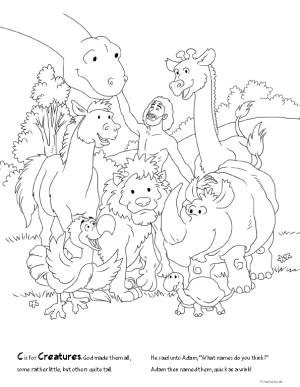 Go here to download these coloring pages in PDF format. This is the most wonderful web site! It has everything you would need to teach children the precious Word of God. Our church loves your curriculum. We just finished the 3 year Answers. Just needed some fill in material for the next 3 years!! Thank you for making the extra sheets available on line!